Greatly preserved, the plate we’re going to analyse is such a sample of Montelupo Fiorentino’s sixteenth century pottery production. Painted in a vivid yellow yolk, it’s decorated with a popular life scene, according to the artistic tradition at that time. Focusing on the item we’re analysing, a green, orange and blue clothed horseman is depicted. The feather on his cap as well as the river in the background, manganese blue painted both, are meant to recall the sleeves of his cloth. Such a dark blue tone, from lapis lazuli precious stone mainly, was commonly employed to decorate the artworks only refined and demanding customers asked for. 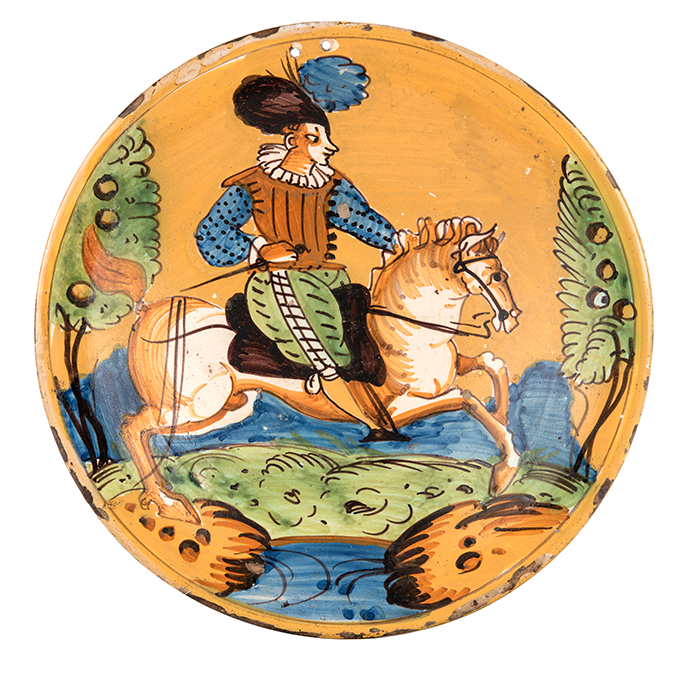 This plate is one of Montelupo Fiorentino’s most renowned pieces of pottery, as the character is depicted on – the so called Arlecchino – can prove. Artworks like this are today kept at the most important museums, such as Victoria and Albert Museum in London. Because of the renewed interest in their bright colours, several art critics compared such pottery plates to the Iberian earliest twentieth century painting and to Picasso’s pictures especially. Created by Certini Web Design.